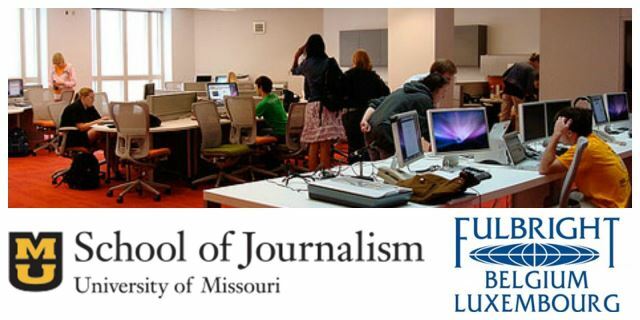 The Fulbright Commission and the University of Missouri scholarship are offering a scholarship for a mid-career professional (Belgian or Luxembourgish citizen) in journalism with at least five years of experience in journalism. Between mid-August and mid-December, grantees receive the opportunity to audit two classes at the Missouri Journalism School and to participate in guest lecturers and roundtable discussions with students and scholars. Grantees are allowed to choose seminars and courses to audit from a list of available courses offered during the semester; their interest areas and availability of spaces will determine final placement. Grantees receive $3000/month for four months plus an additional one-time travel stipend. Interested applicants must complete an online application by December 1st. Incomplete applications will not be considered for an award. Please note that we do NOT require supplemental forms, the letter of the home institution, the signature form or official test results (e.g., TOEFL). You may include test results in the appropriate application fields if you so desire. In addition, the application is to be completed entirely online; NO papers should be mailed to our office. For the Fulbright-University of Missouri Journalism Scholarship only, applicants need ONLY apply to the Fulbright Program, and not to the University of Missouri. Candidates with strong completed applications submitted by the deadline will be invited to the Commission in January for a mandatory interview in English. Interviews are in person, and cannot be rescheduled. The interview will include a discussion of your motivations for going to the U.S., your plans when you arrive, and how you will improve U.S.-Belgian relations as an alumni when you return. Successful candidates will demonstrate ambassadorial qualities, English proficiency, and the ability to explain their academic proposal in simple terms. The interview committee is composed of Belgian and American professors, professionals, government officials, and Fulbright alumni from various fields.